Posted 4 years, 4 weeks ago. 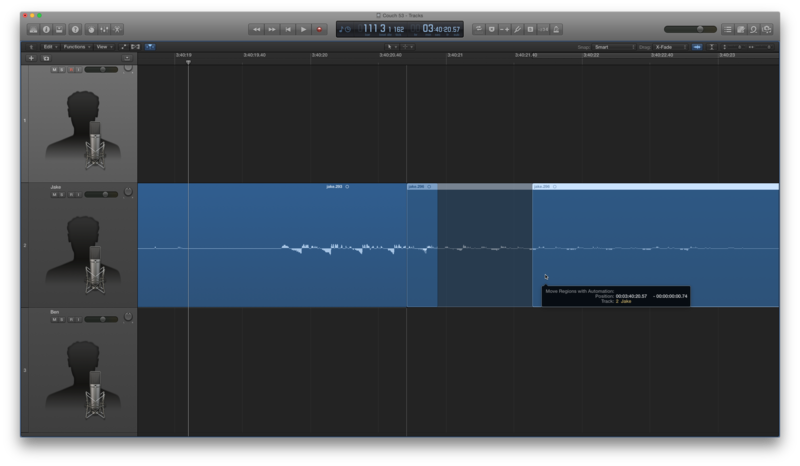 If audio editing is done right, you don’t even notice. You just think that’s how it sounded. This leads to people saying things like “I don’t even know why you spend so much time editing, it sounds fine as is”, which sounds harsh, but in reality is a huge compliment. 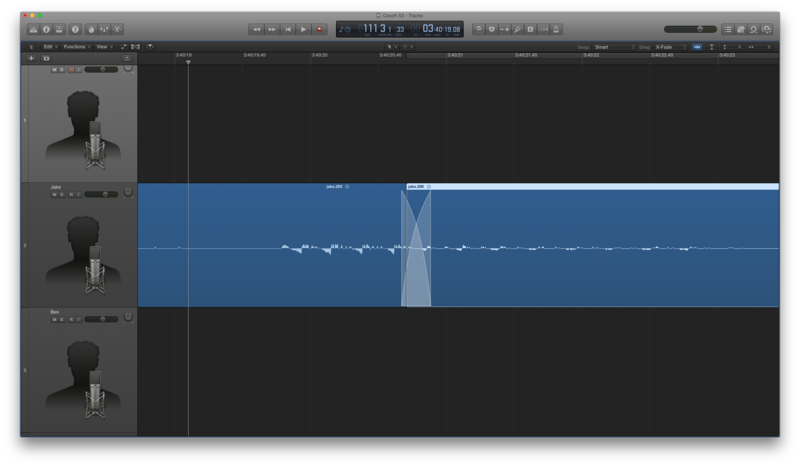 One of my favourite tricks falls directly in this area because, when done right, it sounds seamless. The trick is taking two parts of a sentence where the speaker repeats themselves a little, and stitching it together into one fluid statement. A simple example of this occurs in the last post, where I said I’d never finished reading the Steve Jobs biography, but what this post will cover is the harder trick: stitching to parts of a word together into a single utterance. The snippet I’ll be stitching up. Listening to the audio embedded above, you’ll hear another little snippet from Mobile Couch 53, where Jake describes the motion of one of Bugatti’s pieces of machinery. In it, Jake takes a moment, then finishes the sentence, repeating a word. In this instance, I probably could’ve just stitched the sentence together between words, but that’s not always possible. The word might be uttered without any space between the words before and after, or the speaker might exhale in a way that makes the join difficult. To kick things off, I’ll usually cut everything out between the two instances of the word (or in this case “kind of”, which is spoken as a single word), and bring them together. This allows me to listen and see the formation of the words. 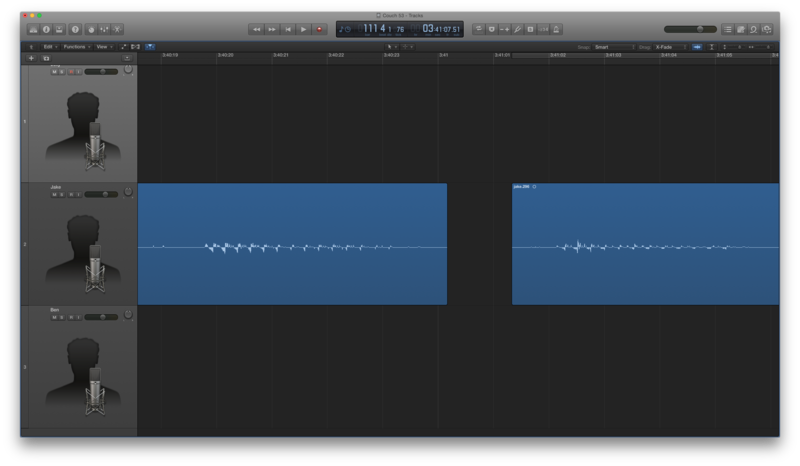 As I get a better idea of how the two instances could go together, I’ll cut parts from each instance, and then attempt to overlap them so that the peaks (the high points in the waveform) and the valleys (the low points) line up as much as possible. I also ensure that the overlap isn’t any bigger than it needs to be. Too much, and it will sound like the person is speaking over themselves. Too little, and the join will sound like a cut. This takes a bit of finesse, but you get better at it. I’ve gotten to the point now where I have a rough idea how long will usually work, and I adjust a little after to really nail it. Lining up the peaks and valleys. Keep in mind that it won’t always work perfectly, and you can end up with a very slight oddness about the way the join comes together. The funny thing is, most people won’t notice because, unlike you, they’re not looking for it. Do the best you can, make it sound as good as you can get it, and then move on. Not bad, right? Can you hear the join in the final clip? Even though I know where it is, and am looking for it, I mostly don’t notice. 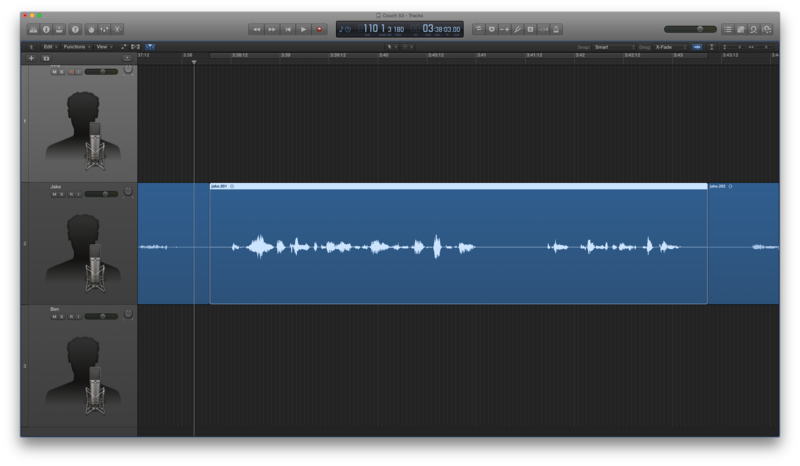 I did while editing, but now I’ve forgotten, and it sounds as if that’s how Jake spoke during our original conversation. This particular trick should also help you nail similar techniques, like cutting out breaths that can happen at the end of a sentence. Either way, if you’re as bad a speaker as I am, it’ll come in handy.